The Bose-Einstein condensation experiment here in the Heinzen lab seeks to better understand the interesting physical properties of ultracold atoms in optical potentials, especially optical lattices. 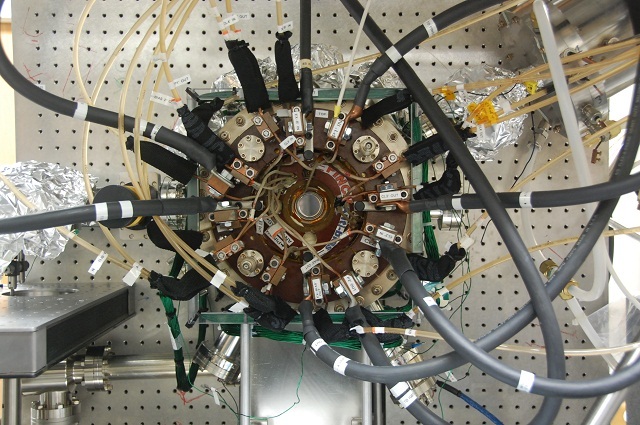 We are just now on our way out of a significant period of downtime, during which much of the experimental apparatus was taken apart, various parts were redesigned, and then put back together in order to make it easier for us to perform some new experiments. The BEC experiment is part of the DARPA Optical Lattice Emulator (OLE) initiative, and we are collaborating with several groups around the world in order to work toward a functioning quantum emulator. Our part in the collaboration is the application of shaped beams to ultracold atoms, a role that brought us together with the group of Professor Michael F. Becker in the Electrical and Computer Engineering department. Working together, we have put together a system that is capable of extremely precise beam shaping, including beams with flat-topped intensities comparable to or better than any in the known literature. We intend to use these beams to better understand the properties of Bose-condensed atoms in various potentials. The field of Bose-Einstein condensates in optical potentials exploded a few years ago when people realized that putting BECs into optical lattices would create a very accurate representation of the Bose-Hubbard model, which describes bosons in a periodic potential. Many groups spent a great deal of time exploring the intricacies of these systems, but the observation of some of the expected critical behavior between the superfluid (SF) and Mott insulator (MI) phases was somewhat indistinct. Part of the problem stemmed from the bowl shape of the optical trapping potentials typically used, which resulted in a wedding-cake-like structure of the sample, mixing regions of Mott insulation with thin layers of superfluidity. One of the first things we intend to do once we get moving is to use our flat-topped beams to examine the near-critical behavior of Bose-condensed rubidium, in order to see if we can observe sharper evidence of the phase transition. Future applications include the study of quantum criticality, and various applications in material science, such as superconductivity. More details will be forthcoming as we learn more.